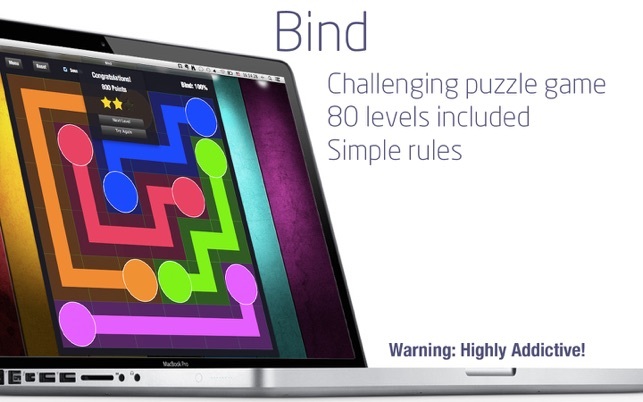 Bind is the challenging new puzzle game that is easy to learn but difficult to master! 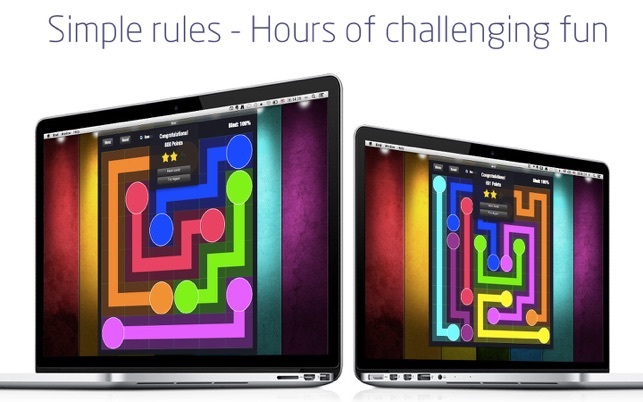 A variation of an old classic, it is very addictive to play and will keep you entertained for hours. + Draw lines to connect each pair of same-colored dots. 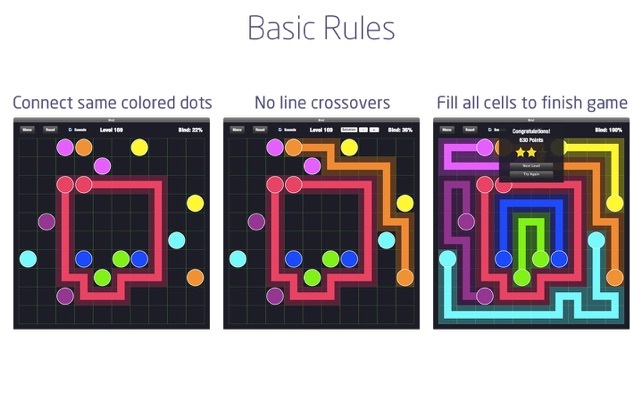 + Do not cross through other colored dots or lines. + Fill all empty spaces to finish each game. 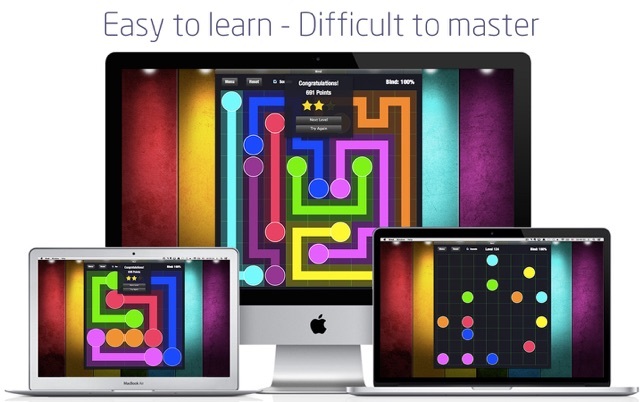 Difficulty increases as the grid becomes larger and you progress through the levels. With each level you complete, the next level is unlocked. Score points and stars at each game based on your speed and accuracy. It’s ok, but scoring is poor. When solutions were quickly found with all squares filled, no undoing of boxes, on several occasions, it resulted in just 2 (out of 3) stars. I can only assume my paths had too many snake-like, back-n-forth, paths or they were not the ones the developers wanted. If it was due to a time limit, there was no mention of this nor any means to know if you’re running too long. 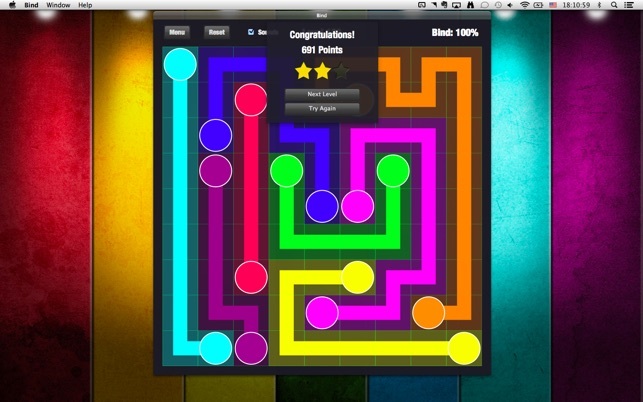 Although, most of the solutions were found taking longer than others, but still scored 3 stars. In short, whether you undo a square or not, solve it fast or slow, you could still receive 2 stars and never know why, preventing you from adjusting your playing in the future. Nice game to pass the time, but don’t expect scoring to be accurate or helpful. As previosly mentioned, I found the first 20 levels rather easy. I can understand why some people would be tired of it’s lack of increasing the challenges at the lower levels. From 21 to 30, I stumbled once and had to redo some squares, a few made me pause and think for a minute. It might be better suited for someone under 12. It’d be good to teach a child mouse skills. I stopped at level 34 to write this review and check out “Flow” that someone mentioned. Works well enough, attractive, fun, easy to use. Can play one game and go away or play many. Only about a quarter of the advanced puzzles are challenging, but this is the free version, and I suppose the paid version should be harder. Scoring is a mystery - it's not explained. Redo of the same puzzle once it's figured out should score differently than the first run-through, but apparently it doesn't. Recommended as a diversion, but not as a real total-absorption challenge. This is a brilliant game. The creator thought of everything. It gets harder and I love the challenge, if you get stumped you can look at the solution. I take a look and then go back and try again. I can not fathom how someone could create so many intricate puzzles. The creator is easy to get in touch with if you have a question. Just what my brain needs. I am so pleased when I finish one. Buy the paid one, it cheap and really worth it.